COLUMBUS, OH. — Former NFL and Ohio State running back, Eddie George, has been named the keynote speaker at a luncheon for the Columbus Area Integrated Health Services Inc. The program, titled “Mental Health: Six Degrees of Separation,” will feature a keynote address by Eddie George, who is expected to relate his own experiences with behavioral health issues. The event, which takes place on May 28 at noon at the Hyatt Regency in Downtown Columbus, hopes to open a public dialogue about behavioral health. Photo shows Former Tennessee Titan, Eddie George, speaking about his induction into College Football’s Hall of Fame. George also won the Heisman Trophy in 1995, as well as the Walter Camp, The Maxwell Award and the Doak Walker award. Columbus Area Integrated Health Services was founded in 1965 as part of Ohio’s first efforts to develop community-based mental health services, the agency offers mental health and supportive employment services, substance use and addictive disorder programs, prison re-entry programs, pharmacy and integrated health care and youth prevention services. All proceeds from the event will go to Columbus Area Integrated Health Services. Watch Eddie George’s Second Act on 60 Minutes Sports in February 2014. George reached heights few have ever achieved on the football field before he hit the low many NFL players find themselves in post-career. But he was able, after therapy, to remake himself in the world of business and entertainment. Eddie George is a former running back who played in the NFL for nine seasons. He played college football for Ohio State University and won the Heisman Trophy in 1995. He was drafted in the first round of the 1996 NFL Draft, and played professionally for the Tennessee Titans. George was inducted into the College Football Hall of Fame in 2011. 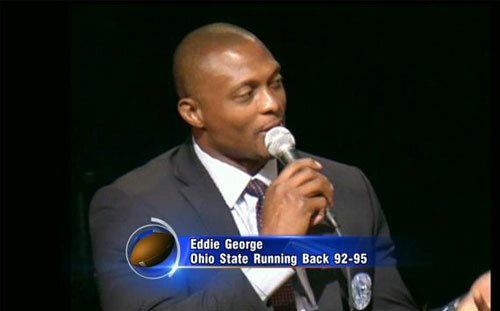 If you would like to book athletes like Eddie George for a speaking engagement or special event, contact Eddie George’s booking agent for appearance and speaker fees at Sports Speakers 360.